Novec 1230 fire Protection Fluid is a next-generation halon alternative designed to balance industry concerns for performance, human safety and the environment, which makes Novec 1230 fluid the first option to non-sustainable technologies. is colorless, odorless and electrically non-conductive. It suppresses fire by a combination of chemical and physical mechanisms without affecting the available oxygen. 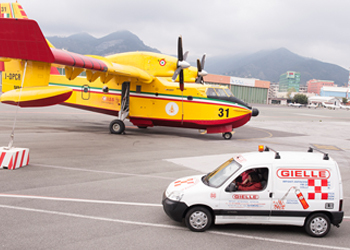 Cold Fire is an environmentally friendly fire extinguishing agent that puts out ANY fire faster, safer, with less water, less damage to property, and less risk to firefighters. Cold Fire cools 21 times faster than water, and works to remove heat and the fuel sources from the fire tetrahedron, preventing reignition. A dry chemical agent called mono ammonium phosphate. The chemical is non-conductive and can be mildly corrosive if moisture is present. In order to avoid corrosion, it is necessary to scrub and thoroughly cleanup the contacted area once the fire is out. A dry chemical fire extinguisher is usually used in schools, general offices, hospitals, homes, etc. A dry chemical agent called sodium bicarbonate. It is non-toxic, non-conductive and non-corrosive. It is easy to cleanup, requiring only vacuuming, sweeping or flushing with water. Extinguishers with sodium bicarbonate are usually used in residential kitchens, laboratories, garages, etc. Carbon dioxide removes oxygen to stop a fire but has limited range. It is environmentally friendly and leaves no residue, so cleanup is unnecessary. 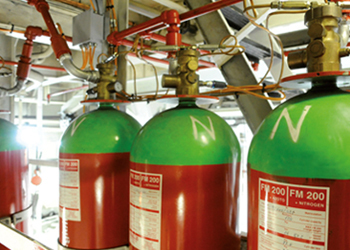 Extinguishers with carbon dioxide are usually used in contamination-sensitive places such as computer rooms, labs, food storage areas, processing plants, etc. A vaporizing liquid that is ozone friendly and leaves no residue. Because it requires no cleanup, fire extinguishers with halotron are ideal for computer rooms, telecommunication areas, theaters, etc. Foam floats on flammable liquids to tame the fire and helps prevent reflashes. To cleanup the affected area, it must be washed away and left to evaporate. 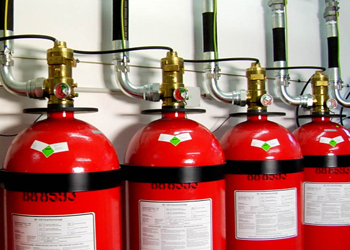 Fire extinguishers with foam are usually used in garages, homes, vehicles, workshops, etc. A dry chemical called potassium bicarbonate. It is non-conductive and non-corrosive. Clean up requires vacuuming, sweeping or flushing with water. Extinguishers with potassium bicarbonate are usually used in military facilities, oil companies, vehicles, etc. The most common agent is water; however, it cannot be used for class B or C fires because it is conductive. Water-based fire extinguishers are usually used in stockrooms, schools, offices, etc.